Join us in Taos, June 2019!! We will meet as a group Sunday evening (June 9) for introductions and an optional meal together out in town. Classes will be each day, monday through friday with a celebratory dinner on Friday evening (This special dinner at the Mabel Dodge Luhan House is included in the cost of the workshop) . There may be occasional evening classes depending upon day time activities. We will meet as a group Saturday morning (June 15) at breakfast to adjourn the workshop. Open to all skill levels from drawing beginners to pros looking for a fresh perspective. New and lifelong journalers alike are welcome! 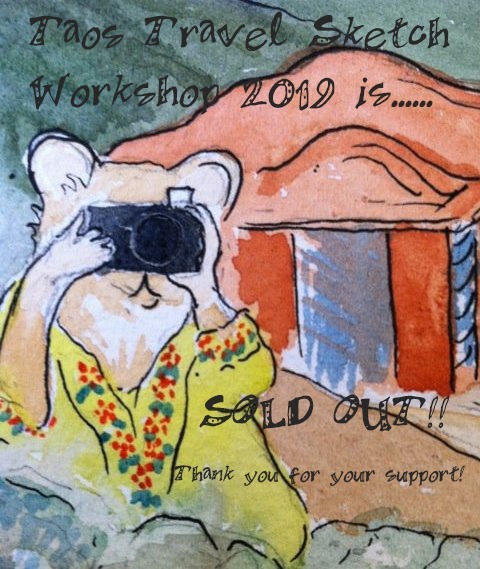 Workshop fee includes pre-workshop instruction video series (great especially for the beginners! ), 5 days of workshop instruction by Amy and 24 hour classroom access at Mabel’s during workshop time. Also, your room with full bath, gourmet breakfasts and lunches, as well as a special farewell dinner at Mabel’s on our final evening together. 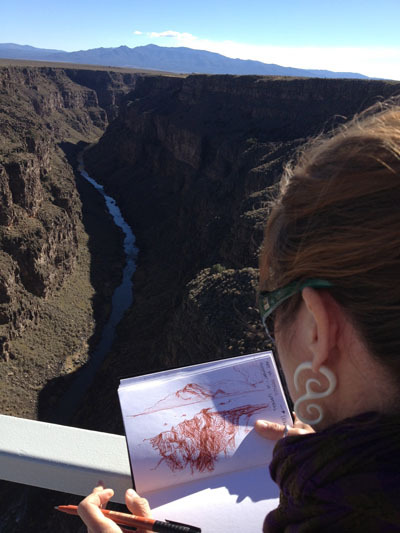 There will be time for self guided field trips to iconic sites in/around Taos in between instruction times; opportunities for excursions and solitary drawing as well as class time and exercises. If you are a Taos local, or have a place to stay in town outside of Mabel’s, a “commuter rate” is potentially available. Along with the workshop fee and classroom usage, this fee includes breakfasts and lunches with the class, as well as our final celebratory dinner together. Contact me directly for more information on this as an option. If you would like to bring along a non-workshop participant (a friend, partner or family member) there is a companion fee option to consider. Contact me for further information about this option. This will be the 9th year I have offered this workshop at Mabel’s and it is my flagship class each year, with new exercises, and new takes on the old favorite ones as well. Each year brings new people, beginners and old salts alike and the alchemy of the group enchants me every year. I do hope you can join us for this very special class. ~~Where it all began…… Back in August, 2009, I went to Taos, New Mexico on a little road trip out of Denver with a dear friend. 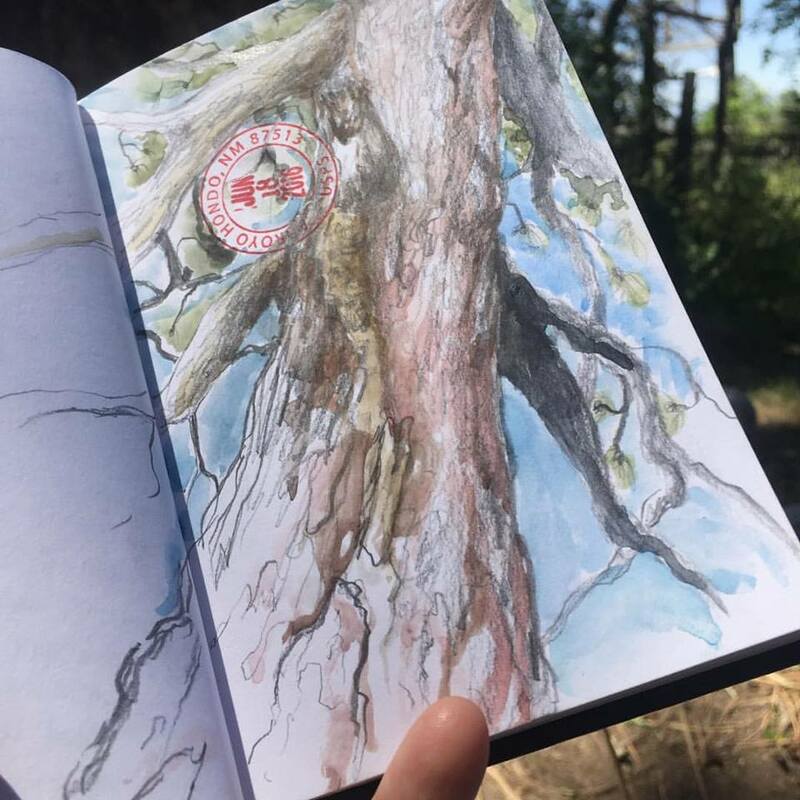 Looking back over that blog post, I see that I wrote the following: “I’d love to teach a travel sketchbook workshop here someday… it would be a wonderful excuse to get back to Taos!” Well guess what folks… that wish has come true! 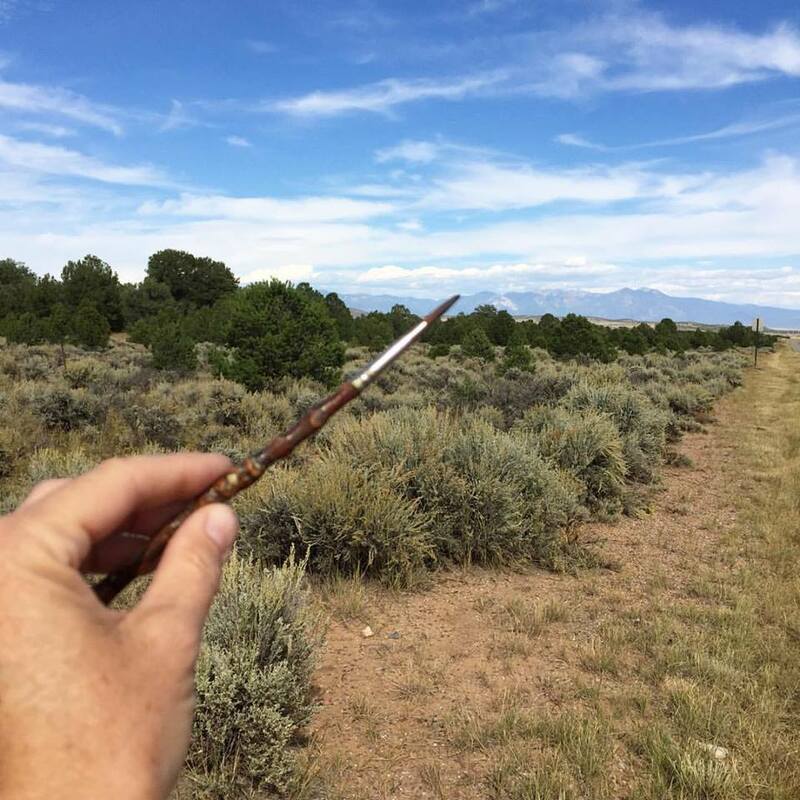 What started out as a small notion in my heart about the beauty of Taos and what it might offer to students as well as to myself has become a reality. 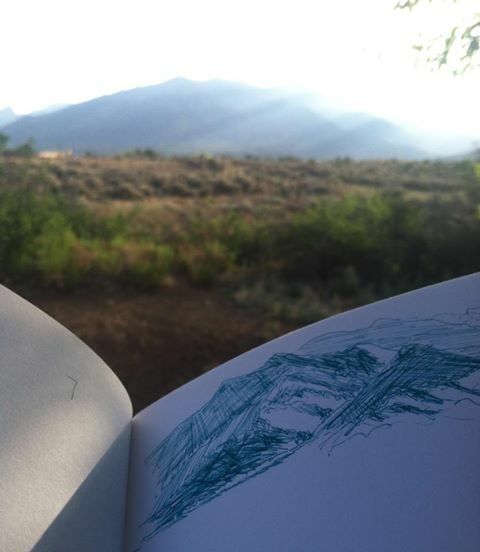 I, along with up to 16 students will travel to Taos for a 5 day/ 6 night intensive travel sketch journaling workshop (see dates for this year above). 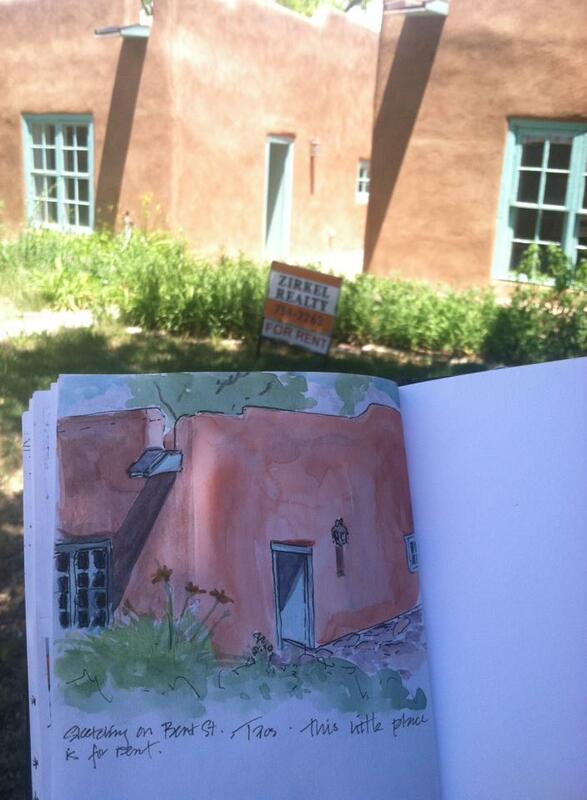 We will be staying at the historic and magical Mabel Dodge Luhan House which offers amazing meals and comfortable accommodations as well as a gorgeous place in which to play in our sketch journals. There will also be opportunities to take a few field trips away from Mabel’s to experience other sides of Taos. This workshop is open to all levels. All registered students will get access to pre-workshop videos which will ensure everyone knows their way around the basic supplies. I created these videos a few years ago when registrants began to arrive from all over the country. Once in Taos, beginners will receive the hands on guidance they need, while more accomplished artists can explore Taos and collect their findings in their books back in the classroom at Mabel’s. 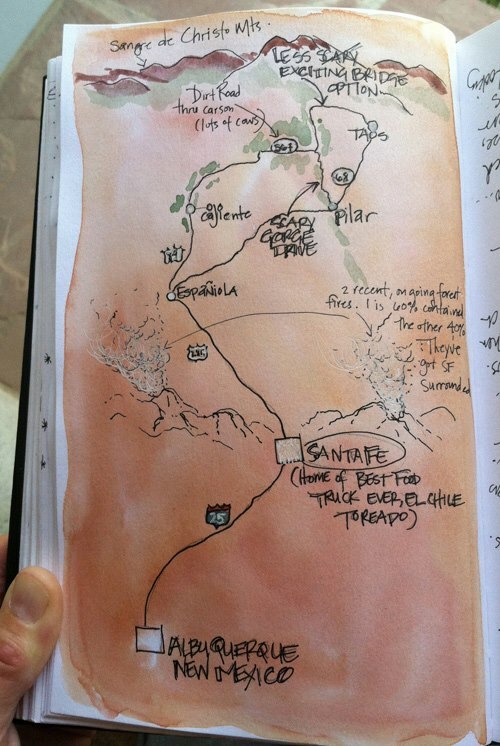 We can work artist to artist to make our travel journals shine with Taos Magic! It is my belief that all artists can learn from one-another, no matter the level! This trip has been going on for a number of years now, and each year there are new things to try and new exercises to learn, along with the tried and true from years past. 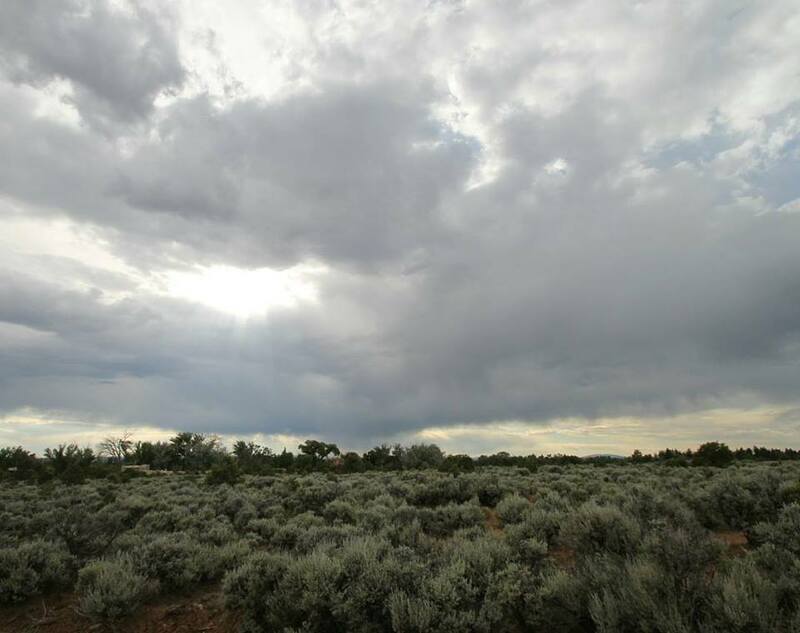 Below are some blog posts from past trips to give you an idea of how spectacular time in Taos can be. And how no two trips to Taos are alike!! this post. I’ll be returning to your site for more soon. Thanks! Pass along the workshop opportunity!! Betty, Consider it done! I am just back in town from a rather off-grid trip and will email you with details this week! Thanks!!!! Thanks Patrick! I’d love to discuss this! I’ll email you!